This old girl has seen it all. From plying the Hawksbury River to hiding in a barn near Goulburn. 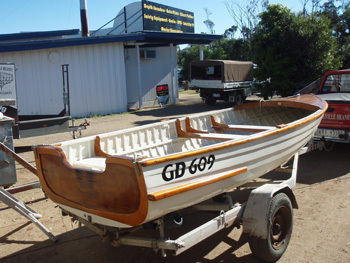 She found her way to our boatworks many many years ago for a bit of a tart up. She then dissappeared and then turned up again nearly a decade later looking a little worse for wear. Her custodian just loves her. So we did what was required. Now both he and his wife are proud and happy owners of a neat little classic outboard powered day launch.